A: Once upon a time, as a walk through the woods was taking place on the part of Little Red Riding Hood, the Wolf’s jump out from behind a tree occurred, causing her fright. B: Once upon a time, Little Red Riding Hood was walking through the woods, when the wolf jumped out from behind a tree and frightened her. B is clearly better than A even though both sentences are, strictly speaking, grammatically correct. What is interesting is how we know this. What is it about us, the sentences, or the world that makes us prefer one over the other? One answer is that we have some dispositional faculty in the mind that has been trained to recognize good from poor sentences. 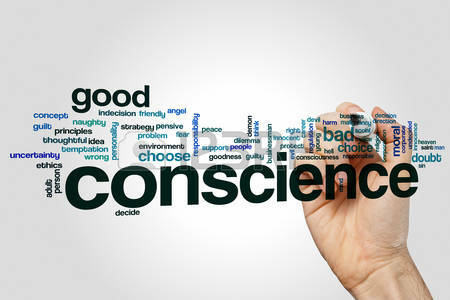 Call it our sentence conscience. How might this go? Perhaps the sentence conscience is analogous to our moral consciences. The moral conscience is a mental faculty that is supposed to cause its owner to feel a sense of guilt if he performs an immoral action. When working properly, the conscience either restrains a person from sin or causes him to feel grief over his sin. The sense of grief is supposed to be sufficient to compel a sinner to repent and make amends for his wrongdoing. Consciences are not sets of beliefs. Rather, they are dispositional powers within the minds of persons. Untrained moral consciences work to some degree. One may recognize some action to be wrong even if one is not sure or if one cannot think why the action is wrong. But the conscience works properly, or fully, if it is correctly trained. In order to work properly, there are two conditions necessary. First, a person must have right beliefs about the moral status of possible actions. If a person thinks that it is morally justifiable to cheat on an exam, then his conscience will fail to work properly after he has cheated. On the other hand, if a person believes that it is morally wrong to cheat on her exams, then she will either feel repulsion about cheating or, if she does cheat, she will feel guilt and shame for her actions. Second, the feeling of guilt and shame for an action must not be suppressed. If a person performs some immoral action and feels guilty, she might seek help. If the person she tells her troubles to tells her that she should not feel the way she does, that she is really not that sinful, and that she should do everything she can to prevent herself feeling the way she does, she will dull her conscience. It is better that one does not suppress one's conscience but, instead, one deals with the sin through apologizing, confessing, and repenting for it. It is far better to have a clean conscience than a conscience that one does not listen to. Analogously, our intuitions about sentences may work in a similar fashion. We have an intuition that one sentence is well formed and that another is not. Our beliefs are sometimes vague. We can tell there is something wrong; we are just not sure what. What is wrong with it? The most plausible answer is that the subjects ('a walk', 'jump') and the verbs ('was taking place', 'occurred') are not the right choices. Instead, the subjects ought to be Red Riding Hood and the wolf and the verbs ought to be 'walk' and 'jump'. Once one has corrected this, the sentence will become clearer. As Williams and Bizup suggest, strong sentences have the main characters as subjects and strong actions as verbs. Second, our sentence consciences should not be suppressed. This is often the job of a teacher. Instead of trying to expunge the feeling that something is wrong, a good writing teacher should point out bad sentences and correct them. However, in our era of moral relativism, grammatical relativism is all the rage. How can anyone criticize a given sentence if that sentence is authentic, sincerely written, and a reflection of the beautiful soul of its author? But doing so dulls the author's sentence conscience. Writing teachers shouldn't act like a modern therapists, always attempting to build self-esteem and suppress the feeling that something is wrong. Instead, they should correct mistakes, teach good grammar, and demonstrate excellent writing.